All popular American and/or European resisitive type fuel level senders with 0-30, 0-70, 0-90, 10-73, 10-180, 33-240, 40-250 ohm (and their reverse) such as GM, VDO, Teleflex, Faria, Centroid, Aerotech, Stewart-Warner, etc. 0 to 5V and 4-20 mA versions are available as a special order item. NMEA 0183 serial 4800 BAUD ($IIXDR sentence). Built-in 85 dB audible alarm. Independent settable low and high level alarms. 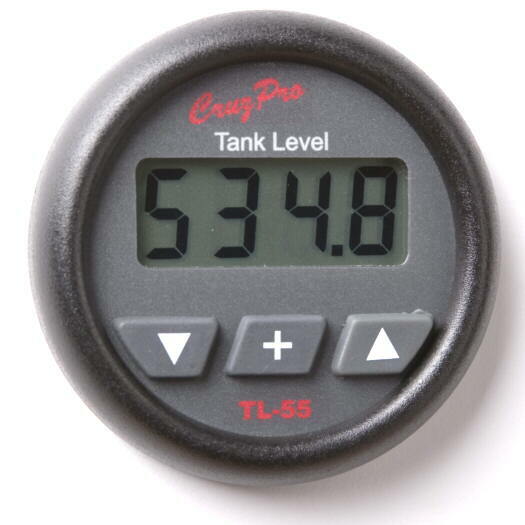 The TL55 Digital Tank Level Gauge provides a digital display for tank level. 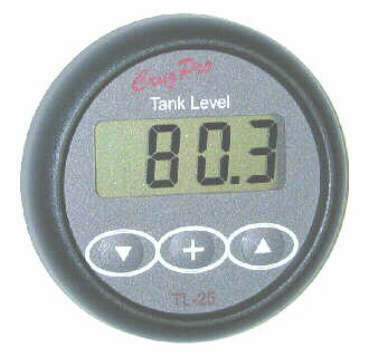 Level can be displayed in liters/gallons or percent (0-100%) up to 999 and as a percentage (0-100%) up to 6500 liters/gallons. The TL55 has been pre-programmed to work with all known resistive type level senders with 0-30, 0-70, 0-90, 10-73, 10-180, 33-240, 40-250 ohm (and their revere) outputs made by VDO, Teleflex, Mercury, GM, Stewart-Warner, Centroid, Aero-Tec and others and works with both American and European style senders (senders available seperately). Low and High Level alarms can be easily set by the user. When activated, the built-in 85 dB alarm will sound and the display will flash. Five levels of backlighting can be selected and all set-up, calibration constants, alarm values and sender characteristics are saved in a non-volatile memory. All constants and sender characteristics are pre-set during manufacture but you may alter these settings to suit your particular needs. Sender selection can be altered over a wide range using the front-panel switches. All information is automatically saved to non-volatile memory. 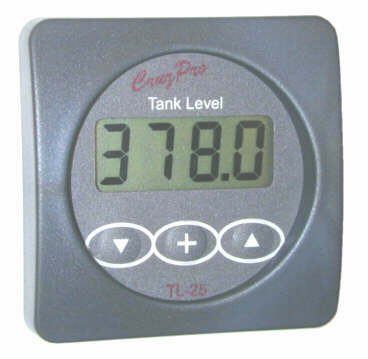 With a press of the button you can display liquid levels in Gallons or Litres or as a percentage (0-100%). 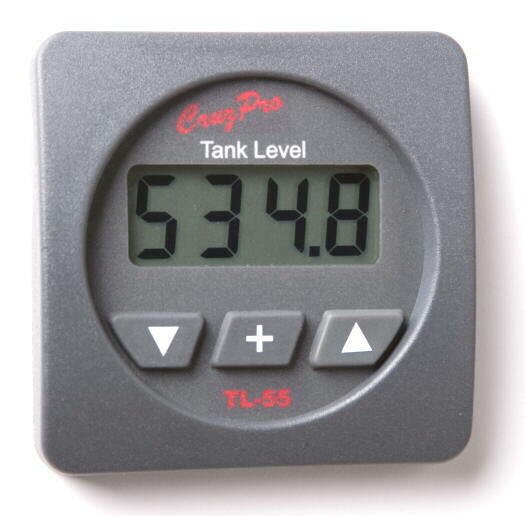 The TL55 draws only 0.017 amps and 5 levels of backlight (including OFF) can be selected from the front panel. The TL55 outputs a regulated 5VDC to the sender so the reading is stable and does not change with raw battery voltage (as standard analog gauges do). The TL55 outputs tank level on the standard NMEA 0183 serial data line at 4800 BAUD. This ASCII information can be used to log performance, repeat the display information at a at a remote location (see www.cruzpro.com/rp30.html and www.cruzpro.com/rp110.html). If NMEA 0183 serial data is not required, then the output terminal can be programmed as an external alarm output pin or Fuel Transfer Pump control line.